We report the genome sequence of a healthcare-associated MRSA type ST239 clone isolated from a patient with septicemia in Malaysia. This clone typifies the characteristics of ST239 lineage, including resistance to multiple antibiotics and antiseptics. Antibiotic resistance in S. aureus is a major concern, as an increasing number of infections are caused by methicillin-resistant S. aureus (MRSA). Figure 1 shows the phylogenetic position of S. aureus in relation to other staphylococci. In Malaysia, the incidence of MRSA-related infections is a cause of concern in hospitals country-wide. Health-associated MRSA (HA-MRSA) has been dominated by a few lineages in Southeast Asia, particularly ST239. Sequence type 239 is an international healthcare-associated (HA) MRSA lineage prevalent in Asia, South America and Eastern Europe, which includes EMRSA-1, -4, -7, and -11 and the Brazilian, Portuguese, Hungarian, and Viennese clones. Strains of type ST239 are typically resistant to multiple classes of antibiotics and antiseptics such as β-lactam antibiotics. Phylogenetic tree highlighting the position of Staphylococcus aureus strain PR01 relative to other type strains within the Staphylococcaceae. The strains and their corresponding GenBank accession numbers for 16S rRNA genes are: S. aureus strain ATCC 12600, L36472; S. saprophyticus strain ATCC 15305, AP008934; S. epidermidis strain ATCC 14990, D83363; S. hominis strain DSM 20328, X66101; S. haemolyticus strain CCM2737, X66100; and S. cohnii strain ATCC 49330, AB009936. The tree uses sequences aligned by the RDP aligner, and uses the Jukes-Cantor corrected distance model to construct a distance matrix based on alignment model positions without the use of alignment inserts, and uses a minimum comparable position of 200. The tree is built with RDP Tree Builder, which uses Weighbor  with an alphabet size of 4 and length size of 1000. The building of the tree also involves a bootstrapping process repeated 100 times to generate a majority consensus tree . Staphylococcus lutrae (X84731) was used as an outgroup. We have chosen a representative of an MRSA strain, termed MRSA PR01 isolated from a patient with septicemia, isolated from a hospital in Kuala Lumpur. Table 1 indicates general information gathered on MRSA PR01. The MRSA PR01 strain has been identified as sequence type 239 (ST239) by multilocus sequence typing (MLST). Initial disc susceptibility tests showed that the strain is resistant to β-lactam antibiotics oxacillin, ampicillin, cefuroxime, ceftriaxone, gentamicin, erythromycin, ciprofloxacin and co-trimoxazole. a) Evidence codes - IDA: Inferred from Direct Assay; TAS: Traceable Author Statement (i.e., a direct report exists in the literature); NAS: Non-traceable Author Statement (i.e., not directly observed for the living, isolated sample, but based on a generally accepted property for the species, or anecdotal evidence). These evidence codes are from the Gene Ontology project . This organism was selected for sequencing as a representative of MRSA infection in a local Malaysian hospital. The genome sequences of this organism were deposited in GenBank (WGS database). Sequencing, finishing and annotation were performed at the Integrative Pharmacogenomics Centre (PROMISE), UiTM. Table 2 presents the project information and its association with MIGS version 2.0 compliance . MRSA PR01 was grown overnight under aerobic conditions in Tryptic Soy Broth at 37°C. DNA extraction was performed using MasterPure™ Gram Positive DNA Purification Kit (Epicentre, Madison, USA) as per manufacturer's instructions. The concentration and purity of resultant DNA was assessed by UV spectrophotometry (Nanodrop, Thermo Scientific). 5 µg of genomic DNA (A260/280 = 1.88) was used for library preparation. The genome sequence was obtained using 104 Mb of paired-end (300 bp spacing) data from the Illumina GAIIx platform (Illumina, San Diego, CA) with 36-bp reads. Sequence data were assembled using CLCBio Genomics Workbench (CLC bio, Aarhus, Denmark). One hundred and ninety-five contigs (N50: 13,272 bp) were generated, and were overlaid with the reference sequence Mu50 using OSLay. Fourteen supercontigs were generated as a result. Gaps were closed using Sanger sequencing. The genome was annotated using BASys  and RAST . The MRSA PR01 genome consists of a 2,725,110-bp circular chromosome with a GC content of 32.6% (Table 3). The MRSA PR01 genome contains 2668 CDs with 19 rRNA features (). A total of 1722 (64.5%) of protein coding genes were assigned to COGs, and a breakdown of the functional assignment of COG-assigned genes is shown in Table 4. Plasmid sequences were only partially sequenced. Figure 2 depicts genomic regions of interest found in the preliminary analysis of the MRSA PR01 genome. a) The total is based on the total number of protein coding genes in the annotated genome. 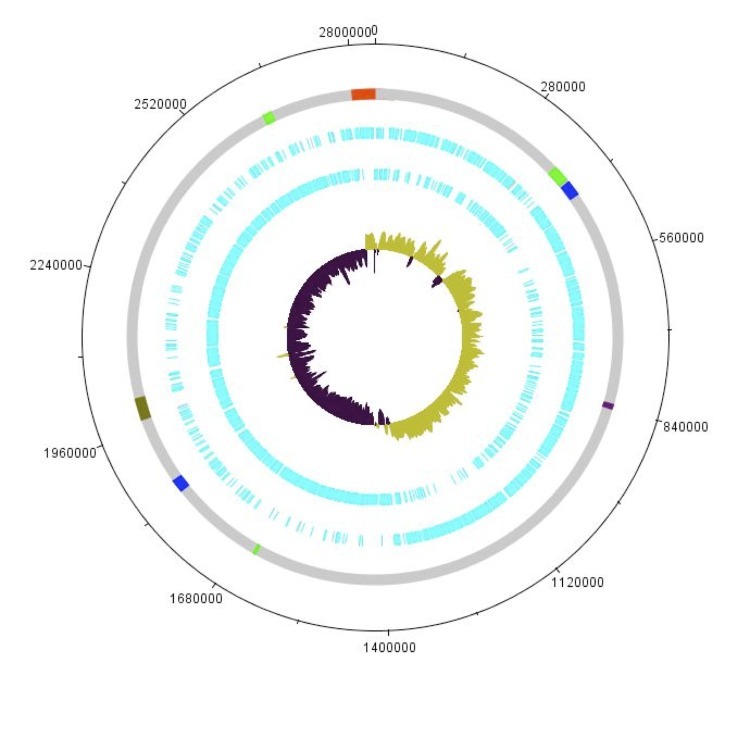 Visual representation of the MRSA PR01 genome. From outer to inner tracks: Scale (in bases); annotated CDSs colored according to predicted function (refer to legend); forward strand CDS; reverse strand CDS; GC skew. Initial analysis of the genome revealed several key features. This genome has a typical SCCmec type III cassette, containing cadmium resistance genes. SCCmec type III is a composite element that is comprised of SCCmec and SCCmercury. In the MRSA PR01 genome, like others, this region harbors ccrC, pI258 and Tn554 as well as the genes involved in cadmium resistance. The MRSA PR01 genome contains two pathogenicity islands, and several resistance features were identified such as the qacA gene, which confers resistance to antiseptics such as cationic biocides, quaternary ammonium salts, and diamidines via an export-mediated mechanism, and the norA gene which confers resistance to hydrophilic quinolones such as norfloxacin and ciprofloxacin. There were 9 regions defined as prophage regions by PHAST  with one complete prophage region. This study is the first to report on the whole genome sequence of a Malaysian MRSA isolate. Preliminary analysis of the genome has highlighted the genetic determinants that are responsible for the organism to adapt easily to selective pressures. Further research is being conducted to provide insight on the adaptive power of this healthcare-associated strain to attain high resistance to antibiotics. Nucleotide sequence accession numbers. This Whole Genome Shotgun project has been deposited at DDBJ/EMBL/GenBank under the accession ANPO00000000. The version described in this paper is the first version, ANPO01000000. Schleifer KH, Bell JA. Family VIII. Staphylococcaceae fam. nov. In: De Vos P, Garrity G, Jones D, Krieg NR, Ludwig W, Rainey FA, Schleifer KH, Whitman WB (eds), Bergey's Manual of Systematic Bacteriology, Second Edition, Volume 3, Springer-Verlag, New York, 2009, p. 392. Van Domselaar GH, Stothard P, Shrivastava S, Cruz JA, Guo A, Dong X, Lu P, Szafron D, Greiner R, Wishart DS. BASys: a web server for automated bacterial genome annotation. Nucleic Acids Res 2005;33(Web Server issue):W455-9.